Student retention is a vitally important topic for recruiters and education administrators alike. The business case for improving retention and completion rates is clear (see graphic below). However, an institution or a school’s effectiveness in managing retention is also increasingly seen as an important indicator of quality and commitment to student success. We have written extensively on the topic previously, most recently in a feature on predictive modelling as a means to improve student selection and retention. And, in the first quarter of this year alone, we now see a number of new studies with some important findings on boosting retention and completion rates. The New York Times recently reported on two US studies focused on international students. The first, by CK Kwai, director of international programmes at the University of Maine, looked at the factors that influenced retention of international undergraduate students at two university systems in the US Midwest. The study was wide-ranging and explored issues of academic performance, integration into campus life, and the students’ academic and personal backgrounds. That two of the factors were academic is significant, Mr Kwai said, since it suggests that good early academic advising could improve international student success. Regarding campus employment, Mr Kwai imagined that having a job could make a student feel more a part of the institution. A second study, by Kent State University’s David L Di Maria, explored attitudes of front-line student services staff towards international students at several Ohio universities. “Staff members in offices like residence life, student counselling and career services often are asked to work closely with international students but do not have specific training to meet their needs,” notes The New York Times. Half of the staff respondents to the Di Maria study indicated they felt unprepared to work with international students. 64% reported their offices had not taken any specific steps to accommodate the needs of foreign students, and 90% of respondents said they wanted more training to support their work with visiting students. First, they represent important contributions to the question of international student recruitment in a context where much of the available research often does not fully segment or report on international students specifically. Second, they underscore the importance of actively monitoring student performance – how otherwise, for example, would the students needing additional support in the Kwai study be identified? – and of an institutional commitment to improving services for foreign students. These very points are strongly reinforced in a further study released earlier this year by the Education Trust. 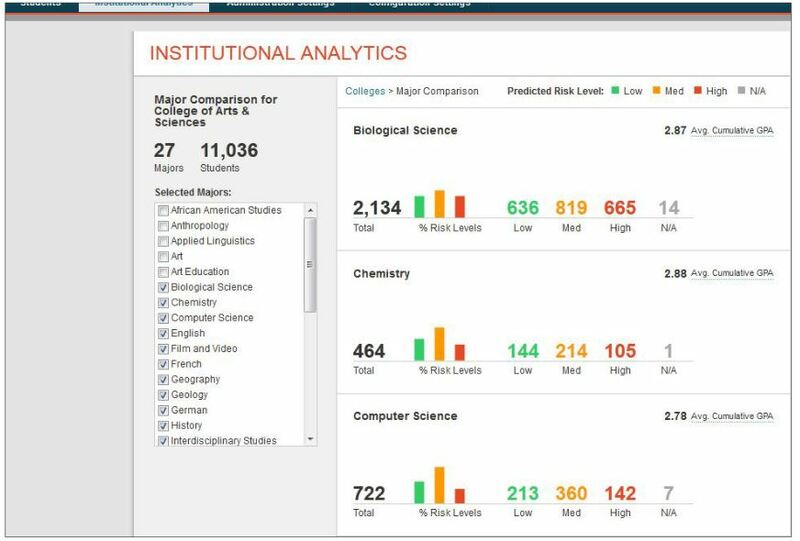 The report, Learning from high-performing and fast-gaining institutions: Top 10 analyses to provoke discussion and action on college completion, is a remarkably clear and practical examination of the student performance analytics practices at eight US universities. “To save leaders at other campuses from having to invent an initial set of analyses for themselves, we’re sharing 10 of the analyses that leaders at these eight institutions (and others) found to be particularly powerful in galvanising attention and action,” note the report authors. Staying ahead of the [retention] game is essential; a 2013 survey of 100 universities in the UK found that 41% of “at risk” students – that is, students at risk of not completing their intended programme of study – were identified too late for the university to resolve the students’ issues. The Education Trust report is a compelling counterpoint to the UK survey and an important review of some of the emerging best practices in this area of data analytics. It illustrates the extent to which good data on student performance can be used to intervene to assist students at risk, but also to improve systems and services for students across the institution or school. This entry was posted in Europe, Higher Education, Most Popular, North America, Regions, Research, United Kingdom, United States and tagged universities with international students, study abroad, tertiary education overseas, student mobility, undergraduate student recruitment.